Gurney's Beneficial Bug Blend | Gurney's Seed & Nursery Co. This superior blend of flowers and herbs has been specially formulated to attract beneficial insects to your garden. Irresistible to good bugs such as ladybugs and lacewings, which work to eliminate destructive pests that do damage to plants and crops — also attractive to pollinators such as honeybees and butterflies. 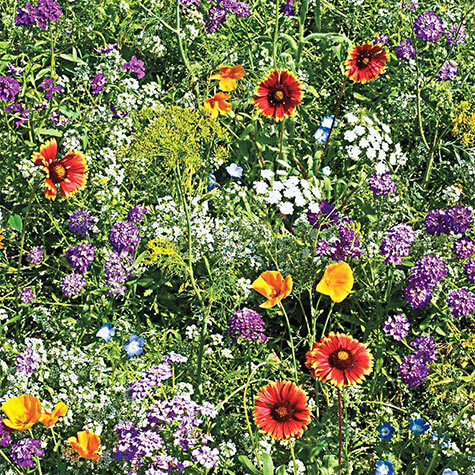 Mix contains varieties including Annual Candytuft, Sweet Alyssum, Dwarf Cosmos, Cilantro, California Poppy, Baby Blue Eyes, Lance-Leaved Coreopsis, Annual Gaillardia, Shasta Daisy, Dill, Black-Eyed Susan and more. Simply direct sow after last frost. Botanical Name: Mix of varieties. Height: 12 - 48 inches. Spacing: Planting rate of 9 - 18 lbs. per acre. Foliage: Shades of green foliage. Blooms: Long season and range of bloom times. Germination: 7 - 28 days. Flower Form: Range of blooms. Seed Count: Approximately 300 seeds per packet, 1/4 lb. has approximately 70,500 seeds. Comments: Contains: Annual Candytuft, Siberian Wallflower, Cilantro, California Poppy, Baby Blue-Eyes, Lance-leaved Coreopsis, Cosmos-dwarf, Annual Gaillardia, Gayfeather, Shasta Daisy, Bishop's Flower (or False Queen Anne's Lace), Dill, Globe Gilia, Purple Prairie Clover, Black-Eyed Susan, Rockcress, Basket-of-Gold, Sweet Alyssum, Bergamot. This mixture attracts benefical insects to the garden. Beneficial insects include lacewings, lady bugs, hover flies, tachinid flies and parasitic wasps, which help to destroy harmful garden pests such as aphids, thrips and mites.